Hey there. Remember when we were kids and you would hang out at the school yard, people watching? My friends and I would spend our lunch time going, "She's a cutie. She's a hottie." whenever an attractive female came our way. I'm certain that it wasn't just the guys doing it since I would often catch groups of girls doing the same thing. We never hurt or disrespected anyone by doing it and it was just simple fun for us to have at that time. Well, what if I told you that you can do the same thing now and possibly win $1000? You'd jump on it, right? 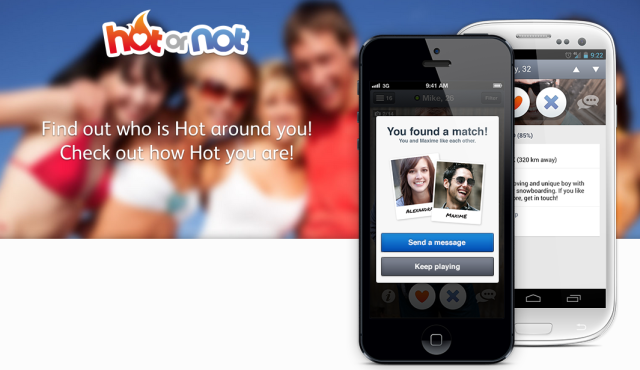 Hot or Not has just released a major update for their Hot or Not App and want you guys to check it out. You can scroll through thousands of pictures on your mobile device and rate them as you see fit. You can also like and share pictures, chat with other users, check out your friend's scores, and find out what kind of common interests others close have with you. You can even submit your own picture and let the users rate your picture! And let's not forget about the Hot or Not Sweepstakes! Download the Hot or Not app, check it out, and then enter to win a $1000 giftcard to the retailer of your choice. It really is that easy but you better hurry. The winner will be announced on Feb. 15th, 2014. Not too bad a prize for rating pictures of your friends on your mobile device. The app is currently available for Apple and Android devices. Make sure to check out the Apple Store and Google Play to make sure that your mobile device is compatible. Also, make sure to stop by the Hot or Not FB page for additional updates and sweepstakes info. Their fans are also users so you may strike up a conversation or two with other Hot or Not users. Who knows, maybe one of those pictures that you rated high might yield a new friendship! Good luck, my friends! Later!